I can't wait for this to come out on kindle. Favorite series. HOORAY!!! I ordered mine yesterday! I can't wait to start reading!!! Thank you so much for being so AMAZING!!! Yay! I can not wait for this to come out on kindle....love these books! I ordered my copy yesterday on amazon and UPS just dropped it off to me today! I'm SO excited! I can't wait to get home and start reading! This is a fantastic series! 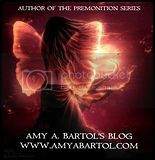 Thank you AMY BARTOL!! I'm tempted to order the paperback because I don't know if I can wait for the ebook to come out on Dec 7th! Going to re-read the first three to hold me over. YEAH!!!!! I'm so excited! THANK YOU! I can't wait for December 7th!!!!! ah!!!!! Praying for the ebook to come out before Dec 7!! Fingers crossed! It ended up beautiful. I love paparbacks so much more. Unfortunatety I'll have to wait for the e-book, because I'm from Brazil, and it would take forever for this book to get here. Eeeeeeeppppppp!!!! So excited...can't stand it! Amy...you are completely awesome! Can't wait to read Chapter 16 to get the answer to that little nagging question! Congrats and job well done and thank you for giving us such a wonderful story with characters we love and love to hate! AH!! GKDSJGFH! I am so excited right now. I cannot wait to get my hands on this! Im pre-ordering this on amazon ASAP. To say I'm excited is an understatment. Being in Australia, Dec 7 is my only option so thank you SO much Amy!!! LOVE LOVE LOVE your work!!! Amy! Thank you so much for putting Evie's story on paper... Or in my case... Ebooks! I absolutely love this series! You are absolutely amazing. I almost had a heart attack when I saw the December 27th date above. Thought the date was pushed back. I was so confused... Glad that isn't the case.... I cannot wait til December 7th... For the Ebook version. So tempted to buy actual book though. Thank you again!!!! Will you also put this on Smashwords for those of us that have the Nook instead of the Kindle?? I love these books! I'm so excited to get it on my Kindle. I'm not entirley sure I can wait two days. I'm itching to read it! Wonderfully written books. I love your work! The important thing from my point of view is that they continue to develop and grow as they move through the books. Their experiences naturally change them, and their relationships with each other also alter. Thanks. Thanks for this post. I saw the video “I’ve been in love”. I must say that I was very keen to watch that video. Thanks for posting those photos. By seeing this pictures everyone will be able to identify the actual copy of the incendiary. Please do come up with such articles.